Jermaine Lamarr Cole, better known as J. Cole, is no stranger to a mixtape; his 2007 debut mixtape, The Come Up, gained the rapper critical acclaim and grabbed the interest of hip hip mogul Jay-Z. Now with two studio albums under his belt and another on the way, J Cole and label cohorts Bas, Omen and KQuick have released a free mixtape to wet our appetites as a precursor to his imminent new album release. Has J Cole been able to return to the form which gained him such widespread praise in 2007? In celebration of J. Cole’s 29th birthday and Dreamville records getting a distribution deal with Interscope, J. Cole and friends have released a mixtape showcasing the talents of the label’s artists. 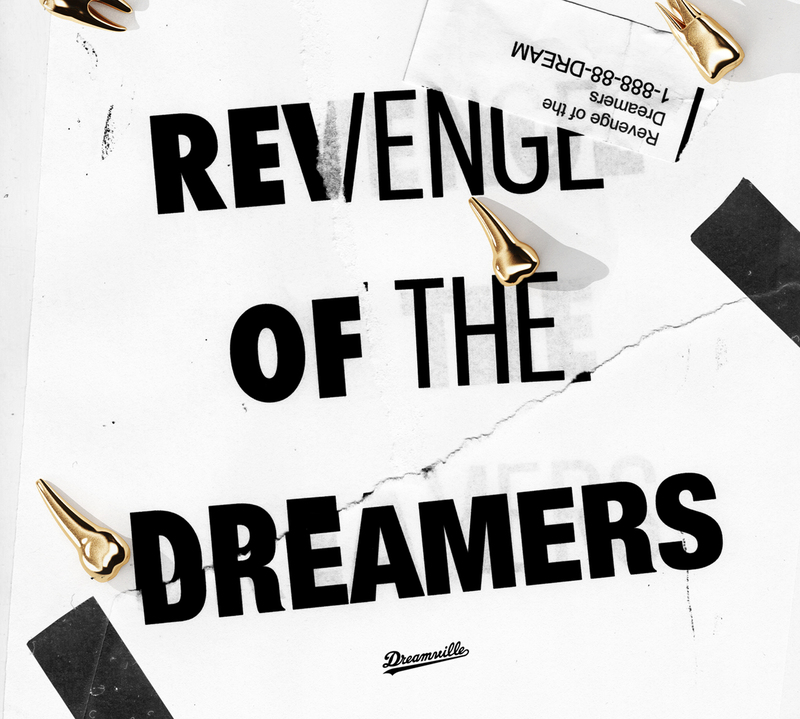 Revenge of the Dreamers serves as an introduction into Cole’s new label with long time collaborates Bas, Omen and KQuick. The project features four tracks from Cole, three from Bas and two from Omen as well as a posse cut with all three of them and a J. Cole feature on a Treasure Davis song. Having built a loyal fan base through mixtapes, J. Cole knows the importance of building a brand before releasing an album; Revenge of the Dreamers gives Bas, Omen and KQuick a large platform to gain extra exposure while fans of J. Cole get new music to tie them over until the release of his third studio album. Similar to Kanye West’s Can’t Tell Me Nothing mixtape in 2007 that opened with a snippet of what would eventually become the smash hit Stronger, Revenge of the Nerds leads with a snippet of what could potentially be a track off of Cole’s next album. The snippet is 50 seconds long and see’s an unforgiven J.Cole rap recklessly over a modernised Tupac – Ambitionz Az A Ridah beat. J. Cole’s other tracks on this project include the title track, Revenge Of The Dreamers, seeing a return to his mixtape best and providing a real treat for fans of The Warm Up mixtape. Blowing Smoke also boasts retro Cole raps over experimental Flying Lotus-esque beat and Crooked Smile (Original Version) samples Bootsy Collins – What’s A Telephone Bill and is seemingly the predecessor to the track Crooked Smile of Cole’s last album Born Sinner. Bas makes his introduction to this project with the melancholy track, Golden Goals, followed by last summer’s anthem, Lit, featuring KQuick and J. Cole and finishes with the track Cello with the G’s, leaving a forgettable impression that could have been avoided by selecting more energetic songs, especially for showcasing purposes. Omen, like J. Cole not only raps but also handles his own production and is sought after by other artists. On Motion Picture, Omen takes a similar approach as Bas on Golden Goals in terms of subject matter yet Omen pulls it off more convincingly with repeatable story telling. Omen’s other track Henny Flow steps away from the serious tone on this project and shows Omen’s playful side, letting us know that he’s not simply a one trick pony. The Treasure Davis song May The Bitter Man Win features a vintage J. Cole verse that sounds like it could be his production. The posse cut titled B*****z sounds like a result of the three artists enjoying too much fun in the studio. Overall, as an ‘out of the blue’ surprise mixtape, you can’t be overly disappointed at the finally product. This being said, more time and effort could have propelled this project from a single listen assortment of tracks to a heavy rotation mixtape. With the additions of some skits that introduce each artist, explain the label situation and their goals for the future, this mixtape would have felt more like a body of work rather than a handful of songs thrown haphazardly together, but maybe their intention was to wet the palette before giving us the main course, time will tell. Have you given this a listen yet? What are your opinions on the artists signed to Dreamville? Other than J. Cole who do you see being the most successful? Leave a comment and let us know. Treasure Davies is still yet to drop more so we can rate him. But then again, anything from #DreamVille Records is of amazing craft and well picked talent.